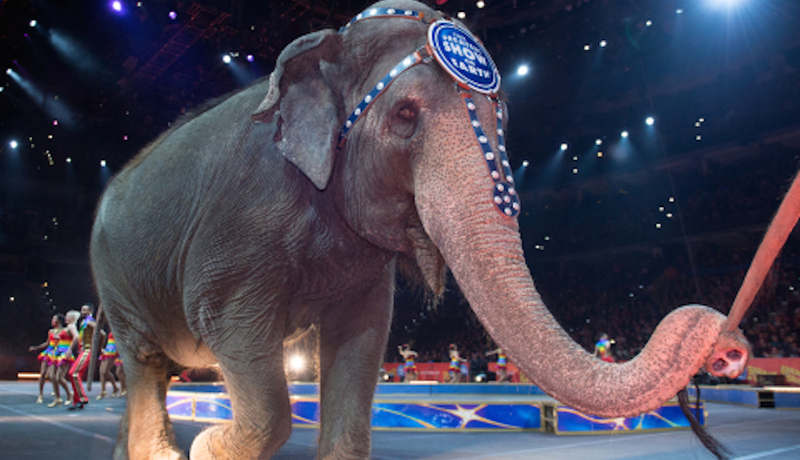 Should All Animals Be Banned from the Circus? That was the Facebook status of a Philadelphia artist friend of mine on Wednesday morning, and I’m pretty sure that it was directed at me. This wasn’t just any Ringling Bros. circus. No, this is the last Ringling Bros. circus that will include elephants, an animal that has been a prominent feature of the “Greatest Show on Earth” since the 1800s. A decade or two ago, if the elephants didn’t show up for one of these extravaganzas, there probably would have been an angry mob — or at least some disappointed audience members requesting a refund. But times … they have a’ changed. We’ve seen plenty of videos of elephants being mistreated and neglected, and the animal rights community has grown more active and vocal about the inclusion of elephants in the circus. In recent years, if you had decided to face the shame of being a circus attendee head on, you were guaranteed to see protestors holding up all sorts of signs as you made your way to the arena. Well, according to Ringling Bros., the elephants will retire to their new permanent home at the Ringling Bros. Center for Elephant Conservation in Florida once this current tour of duty is complete. I don’t know if the circus actually caved to the pressure of the animal rights activists and their boycotts, or if it just got too expensive to keep transporting these gigantic beasts and all of the equipment and personnel you need to handle them, especially with attendance numbers that seemed — to me at least — to be dwindling. While that might seem like a huge victory for the activists, their fight is in no way close to being over. Even smaller farm animals like donkeys and pigs are on display this week at the circus in Philadelphia, and some activists (and my artist friend) believe that there shouldn’t be any animals of any kind in any circus. Pennsylvania State Senator Daylin Leach has even introduced a bill that would prohibit the circus from using any animals in their Pennsylvania shows. Leach is absolutely right. We shouldn’t tolerate unconscionable cruelty, but isn’t there some middle ground here? Listen, if you’re just the type of person who thinks that we shouldn’t use animals for our entertainment — period — I don’t think we’re going to get anywhere anytime soon. And if that’s the case, I really hope you don’t use animal products of any kind or support companies that do. But could the industry continue to be reformed so that the animals can be used in the circus without subjecting them to “unconscionable cruelty”? After all, there was a time when animals were used in movies without many regulations, and now there tons of rules in place to ensure that no animals were harmed, as the line reads when the credits roll.